I don’t know about you, but I really dislike January. I am constantly tired, cold and it seems like the longest month ever. At times like these one needs comfort, and I like mine in the form of food, scented candles, duvets or blankets and either a good television series or a good film. Comfort food no 1 for me always involves melted cheese. Nothing can beat its gooeyness and oozing warmth. Paired here with spring onions for both texture and bite, sour cream for creaminess as well as a binding agent and fluffy baked potato and crispy skins. Yummy! The inspiration is Nigella and of course America. And I will not give you a recipe – you don’t need one – just a quick sketch. Wash the potato(es). Bake it/them whole but pierced in a 200C oven until soft. This depends on both oven and the size of the potato but somewhere between 40 and 60 minutes. Cut the potato(es) in half lengthways. Spoon out the fluffy potato and place in a bowl. Mix with spring onions and grated cheese. Add sour cream and mix to combine. Season. Spoon the mixture into the potato skins. Top with some more grated cheese. Place on a baking tray and bake for another 5-10 minutes for the cheese to melt. Serve with crispy bacon and a salad, or just plain. Servera gärna med knaperstekt bacon och sallad. The soup season will soon give way for the salad season, but before it is completely over I would like to serve you this delicious soup. 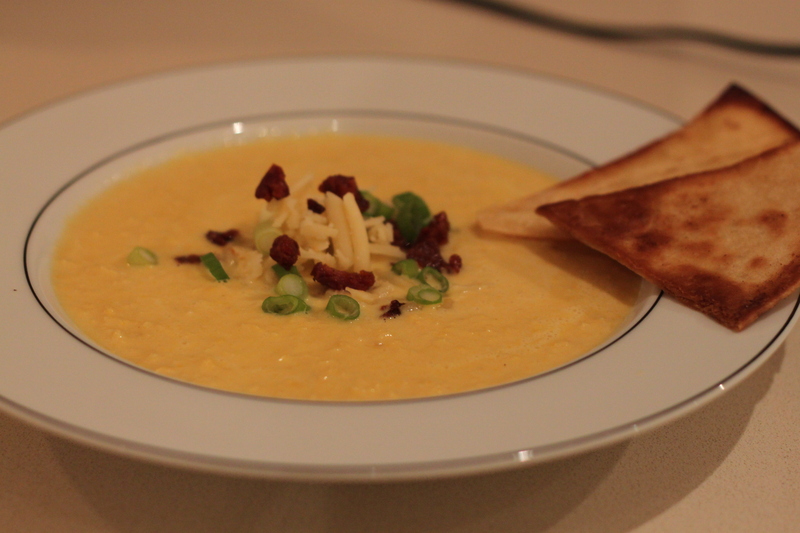 It is a pretty straightforward cream of corn soup, but topped with lovely crispy chorizo, grated cheddar and salad onions. It is the ultimate soup topping for this particular soup and for some reason I picture a cowboy making this in his battered metal saucepan over an open fire. I don’t know why this image pops up but it might have to do with the slight texmex-vibe the combination gives off. To make this connection even more visible, try serving it with tortilla wedges fried crispy in butter. Delicious! Rinse the sweetcorn and drain. Place in a saucepan and add the water and stock. Bring to the boil and let it simmer for about 5 minutes on medium heat. Fry the tortilla pieces golden brown in the butter. Drain on kitchen towel. Fry the chorizo pieces in the same frying pan. Drain on separate kitchen towel. Mix the corn with the water until smooth. Pour it back into the pan. Add the cream and vinegar. Bring to the boil and season to taste with salt and pepper. Pour into bowls and top with grated cheese, chorizo and spring onions. Serve with the fried bread. I have probably raved about Ottolenghis vegetarian cookbook Plenty enough for you to know that I love it and use it quite a lot. The only ‘problem’ I have with the some of the recipes are the more uncommon ingredients that are sometimes required. At least uncommon when not found in a London supermarket. If you live in the countryside and have your own garden it is of course different. 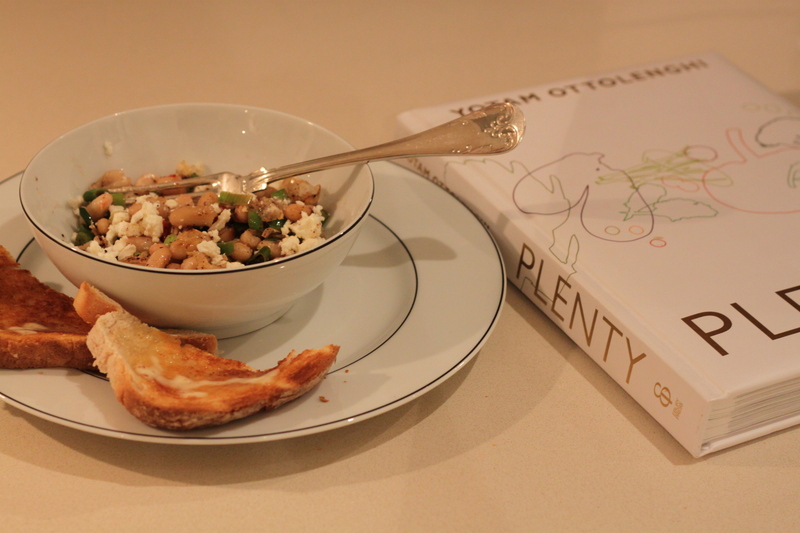 I found a lovely recipe of fried butterbeans with feta, springonions and sorrel. Sorrel being that difficult ingredient to find in a London supermarket this time of year. Because of omitting the sorrel and making a few other substitutes, this is not an Ottolenghi recipe anymore, but close enough. If you want the real deal, then look in his book and make sure you source some sorrel. I ate this bean salad as it is with some nice bread for supper, but you can easily serve it as a side dish at a barbecue, instead of mash with sausages or any other way you want. Rinse the beans and drain. Heat up the butter and oil in a frying pan and only add enough beans to cover the bottom, to fry them in batches. Fry until the beans are golden brown, remove and fry the other batch(es). Add the garlic, chilli and onions to the last batch. Fry for a couple of minutes and add the other beans. Remove from the heat and add the lemon juice and sumac. Add salt and olive oil and lastly the feta.